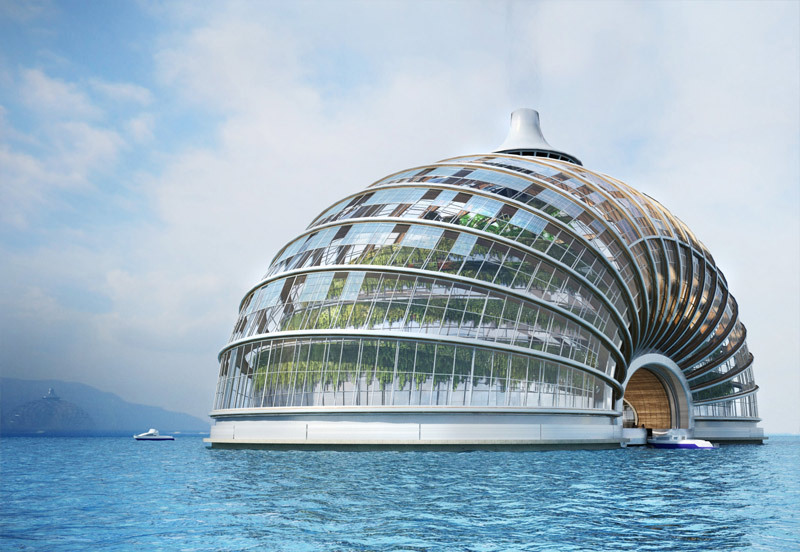 Addressing growing concern over climate change and the rising level of the world’s oceans, Russian architectural firm Remistudio has designed a massive hotel concept that can endure extreme floods. The arch-shaped building, dubbed the Ark, has a structure that enables it to float and exist autonomously on the surface of the water. The Ark was also designed to be a bioclimatic house with independent life-support systems, including elements ensuring a closed-functioning cycle. 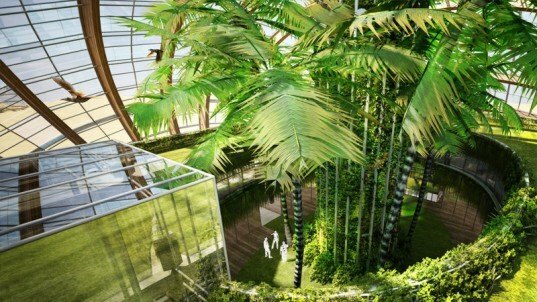 Planting greenery is the next step in creating a bioclimatic building and the Ark is filled with it. The tall, illuminated inside space creates well-lit places to grow plants at any time of day. Enough daylight penetrates through the transparent roof to illuminate the inner rooms as well. The tiered balconies serve as social and recreational areas and the Ark has an open layout that can easily be adapted to different functions over time. The Ark’s structural solidity is provided by compression of timber arches and tension of steel cables. The framework is covered by a special foil made of ethyltetrafluoroethylene, or ETFE. It is a strong, highly transparent foil that is self-cleaning, recyclable, and more durable, cost-efficient and lighter than glass. The foil itself is affixed to the framework by special metal profiles, which serve as solar collectors for heating water and as gutters for collecting rainwater from the roof. The only thing I can see in this project is the similarity (a coincident, or not?) to one of the Jan Głuszak work from 1963. He was a Polish artist and architect. He used “Dagarama” pseudonym. That vision has title “Morule – klimatrony, jednostki mieszkalne o zmiennych przegrodach klimatycznych” (“Morule-klimatrony, residential units with changing climatic panels”). Not only the general form is almost the same, but also the special function (to adapt to various climates) remains without any change. It is not clear how many people this structure is supposed to support, but the amount of grass, planted areas, and half a dozen trees would be nowhere near sufficient to create a "closed-functioning cycle" for the number that it would appear to be able to accommodate. There are also a number of contradictions, for example: talk of naturally-lit internal areas, yet plants shroud a lot of the living areas (and the photovoltaic panels, which seem to be the new invisible models in the artist's renders, would further block light); the structure is supposed to be used in cases of disaster relief, but the need for massive excavation to house the water and energy systems is not mentioned; it's also not clear how the massive pre-fabricated elements would be transported to disaster-affected areas; its stability in any water other than a calm lake looks very questionable; etc. Nice pictures, and uses plenty of architectural cliches, but doesn't really look to provide anything like a practical design for its intended purpose. It would better serve as a concept in the luxury boutique hotels category. 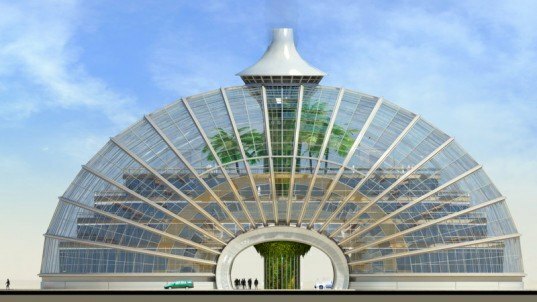 I once thought of a floating greenhouse that can travel north and south during the changing seasons to maximize sunlight. as an intellectual exercise this is interesting but this will never get past the theoretical stage. this idea is nothing new. there have been self contained autonomous structures around for decades that work much better than this. they're called "cruise ships". climate change isn't going to cause massive flooding like this building is designed for. that's not the way it works. melting of the polar ice caps is causing gradual rising of sea level that happening on long term timeline. it is predicted that the sea level will rise 2 meters (6 feet) by 2100. don't get me wrong I'm not trying to deminish the seriousness of global warming. I'm just saying that the designer really doesn't understand climate change. The Ark was designed by Remistudio in connection with the International Union of Architects’ program "Architecture for Disaster Relief." The Ark can be built in various climates and in seismically dangerous regions because its basement is a shell structure, devoid of ledges or angles. A load-bearing system of arches and cables allows weight redistribution along the entire corpus in case of an earthquake. The building's clever design enables an optimal relationship between its volume and its outer surface, significantly saving materials and providing energy efficiency. Its prefabricated frame also allows for fast construction. The Ark constitutes a single energy system. Its shape is convenient for installing photoelectric cells at an optimal angle toward the sun. The cupola, in the upper part, collects warm air which is gathered in seasonal heat accumulators to provide an uninterrupted energy supply for the whole complex independently from outer environmental conditions. The heat from the surrounding environment — the outer air, water or ground — is also used. The Ark concept, which Remistudio designed in connection with the International Union of Architects’ program "Architecture for Disaster Relief," can be built in various climates and in seismically dangerous regions because its basement is a shell structure, devoid of ledges or angles. A load-bearing system of arches and cables allows weight redistribution along the entire corpus in case of an earthquake. The building's clever design enables an optimal relationship between its volume and its outer surface, significantly saving materials and providing energy efficiency. Its prefabricated frame also allows for fast construction. Planting greenery is the next step in creating a bioclimatic building and the Ark is filled with it. The tall, illuminated inside space creates well-lit places to grow plants at any time of day. Enough daylight penetrates through the transparent roof to illuminate the inner rooms as well. The tiered balconies serve as social and recreational areas and the Ark has an open layout that can easily be adapted to different functions over time. The Ark's structural solidity is provided by compression of timber arches and tension of steel cables. The framework is covered by a special foil made of ethyltetrafluoroethylene, or ETFE. It is a strong, highly transparent foil that is self-cleaning, recyclable, and more durable, cost-efficient and lighter than glass. The foil itself is affixed to the framework by special metal profiles, which serve as solar collectors for heating water and as gutters for collecting rainwater from the roof.